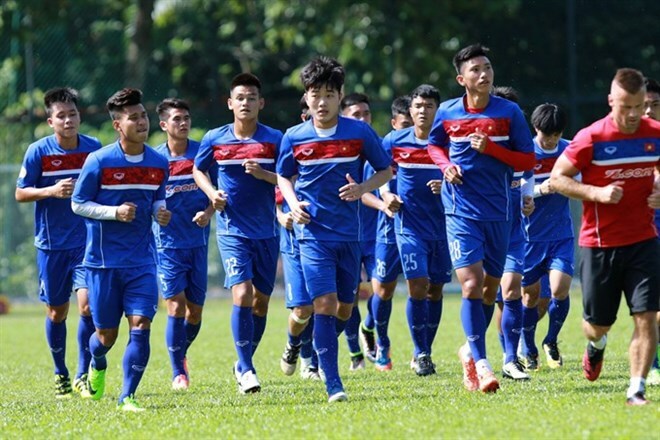 Hanoi (VNA) - Vietnamese coach Nguyen Huu Thang said that the Vietnam national football team was determined to win the Southeast Asian (SEA) Games title this year. Thang made the statement during a press conference on Group B matches at the Renaissance Hotel, Kuala Lumpur, on August 13. It is for the first time during the team’s campaign for the games that the coach has announced his team’s intention to go for the kill — the gold medal — at the men’s football event. “Vietnam has trained for 10 days in the Republic of Korea to prepare for the tournament. Like any other team in the games, we have the belief and the determination to reach the highest podium. I hope that Vietnam will bring its fans quality matches,” Thang said. Earlier, Thang said that Vietnam was targeting to reach the final. On August 13, Thang also announced the names of the 20 players who would take part in the SEA Games. Vietnam, a five-time silver medallist, have never won the coveted SEA Games football gold. They have been drawn in Group B, considered as the "group of death", along with Thailand, Indonesia, Cambodia, Timor Leste, and the Philippines. The team will meet Timor Leste on August 15, Cambodia on August 17, the Philippines on August 20, Indonesia on August 22, and Thailand two days later. The head coach of Timor Leste, Kim Shin-hwan, said the opening match with Vietnam would be difficult for his team, but it would try its best to reach the semi-finals. Timor Leste finished fifth out of six teams in the group stage for an early exit out of the competition in 2015. However, they managed to secure a win over Brunei, despite four other defeats. Vietnam had edged out Malaysia to qualify from the group stage, accompanying Thailand to the semi-finals. Apart from the one defeat to the Thais, Vietnam managed to win the other four group matches. They were, however, surprisingly undone by Myanmar in the semi-final but bounced back to claim the bronze medal after defeating Indonesia.